An independent school ; an atypical method of teaching. For him, the teaching of the UTCCAB, and of the TCCAC, is atypical in that it is emphasising the very source of movement, and the resulting method is easy for everyone to follow. When we know how to keep intact both our physical flexibility and an open and relaxed mind – something which becomes harder with age – our whole being adjusts itself to regain our balance when we trip or slip on the ground : our centre of gravity tries to adjust by pushing on the balls of our feet and by our arms moving in the air to arrest our fall. The atypical approach which our technical advisor, Jean-François Billey, is encouraging us to follow, stimulates the revitalisation and coherence of our body, even when we have neglected it for too long. Through specific exercises it is possible to interrupt the curve of deterioration of our innate physical capabilities : if necessary this dynamic approach will promote the restoration of our emotional and, to some extent, intellectual faculties, regardless of age. Taï chi's series of movements – and all the exercises linked to them – tend to become more fluid and harmonious because they are natural. J-F Billey, and the whole of the UTCCAB team of teachers are proposing an approach to Taï Chi Chuan which is wholly innovative, linking with and re-awakening the life-forces sleeping within us. The goal is to retain the intensity of our life forces throughout our exercises, armed or unarmed. The UTCCAB's novel teaching aims first and foremost to re-establish the body in movement, to free it from fears and stiffness. This approach is accessible to everyone, including”seniors” and those with minor physical disabilities. 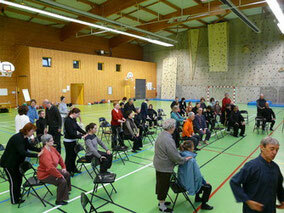 J-F Billey has designed a number of exercises which can be undertaken while seated. A good sitting position, beginning with the roots which are our feet and our legs, allows us to take up postures which promote openness and mobility in all directions, thanks to a better understanding of the internal principles. With the help of these postures we become truly relaxed and to sense that the spinal column is truly stretched. The benefits of working through these seated exercises help us to recognise the intensity of the life we live. Our life does not abandon us with the passage of time, it simply demands that we don't rein it in. If we wish to reconnect with our life forces – as children we knew how to let them express themselves freely – and move towards the rich depths within us, let's begin by reconnecting with our bodies which are ready for us in the here and now : let's open the region of our heart, move down to our stomachs and inhabit our spinal column. It's the only route for conserving our ability to “digest” healthily, as we encounter them, the ageing process and the events which impact our lives. Let's be aware of the over-development of our analytical faculties - brought about by impressive technological developments which should not be rejected en bloc - which has caused us to forget that Life was given to us by the stomach and that the vitality of the body is situated in the stomach. Retaining within us the desire to imitate the naïve and childlike, let us marvel at the spontaneity of young children in whom the whole body dances from the lower dantian – situated at the body's centre of gravity – at the first sounds of lively music. Why, when we become adults – or even practitioners of martial arts – must we become incapable of such bursts of enthusiasm ? Don't we lose our ability to live in the moment ? 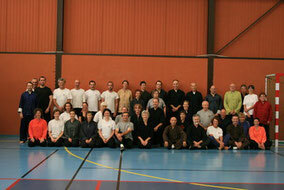 Reconnected with the vital principle, we can re-direct our energy, not only in the practice of our martial art, but also in our daily lives to greatly improve our well-being, our joie de vivre and our health. Master Chu King Hung, mischievous like many Chinese masters, often uses the expression “happy chi”, the “joyous chi”.